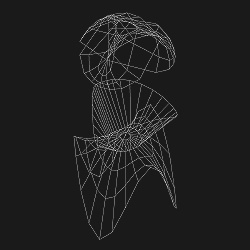 The Gauss map of a perturbed monkey saddle. In the Helsinki ICM, the film "The Gauss Map: A Dynamical Approach" was a preliminary version that led to the 1982 monograph "Cusps of Gauss Mappings"  with Clint McCrory and Terence Gaffney. The illustrations in that volume were wire-frame images similar to those in the Proceedings article. Subsequently that monograph has appeared in an online updated version  with highly rendered images produced byDan Dreibelbis, using software developed by Davide Cervone . Both the original article and the monograph presented of one-parameter families of surfaces involving the appearance and disappearance of cusps on the Gauss mapping. 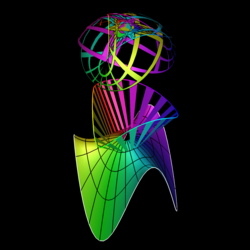 One of them, a perturbation of the "monkey saddle", exhibits a disc on the surface where the Gaussian curvature is positive such that the spherical image map has three cusps on the boundary curve. This provided an example that clarified a construction ofRéné Thom . We consider the monkey saddle, with an isolated point of zero Gaussian curvature, and perturb to get the graph of (x,y,x3-3xy2 + k(x2 + y2)). For k = 0, this surface has a Gauss mapping with a ramification point of order 2, and for k not zero, the image of the parabolic curve will have three cusps.We show the spherical image of a circle x2 + y2 = r2 as r changes. We show the linear interpolation between the surface and its Gauss spherical image so that the singularities of the Gauss map are expressed as limits of singularities of homothetic images of parallel surfaces of the original surface. We then show the spherical image of a test curve centered on the curve r = constant and indicate the behavior of the asymptotic vectors in a neighborhood of a cusp of the Gauss mapping. Included in the previous paragraph is one of the most striking applications of linear interpolation between surfaces with the same parametrization. If we consider the family uX + (1-u)N interpolating between a surface X and its Gauss mapping, then this can be viewed as a scaled version u(X + (1-u)/u N) of the parallel surface at distance r = 1/u - 1. Thus the Gauss mapping can be thought of as "the parallel surface at infinity". Various characterizations of the singularities of the Gauss map in terms of lines of curvature, ridges, and double tangencies are included in "Cusps of Gauss Mapping". Using the linear interpolation between a surface and its spherical image gives an interpretation of a cusp of the Gauss mapping as a limit of swallowtail points on the scaled parallel surfaces.